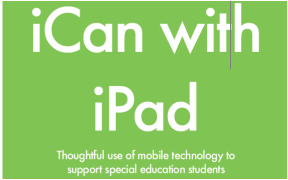 This conference is designed to provide participants with multiple opportunities to explore ways to use the iPad to meet the special needs of students in today's classroom. NOTE: If you have additional information or resources about any of the topics discussed in the Keynote Session, please share your items on the Region IV blog. Click here to access the blog. Audience: Special education teachers, classroom teachers, general and special education co-teachers, curriculum leaders, technology specialists, assistive technology staff, therapists, and administrators should attend. You are encouraged to bring an iPad or other iOS device. Click on the Download File link to view the conference flyer. From screenshots to shortcuts, learn all of the basic "how to" information for using an iPad. This session takes a look at the built-in features and apps that come with your iPad, while shining some light on how to incorporate these ready-made elements into the educational arena. This session also includes some light iPad management information for novice users. The iPad has joined the list of options for providing students with an augmentative communication system (AAC). Teachers and families are showing increased interest in AAC because it now comes in an attractive, lightweight, familiar “package”. It is important that a proper feature/match is done that considers the student’s abilities, environments and communication tasks before determining a communication system. Come learn about the features of various apps for augmentative communication. The task of writing can challenge learners on many different levels, from forming letters to writing reports to taking notes. With thousands of apps to choose from, finding the right app to support students in their written work can be overwhelming. Come to this session for a review of apps that put the unique capabilities of the iPad to work assisting writers with their diverse writing needs. App to download for this session: Good Notes (free). Note: If you already use Good Reader to annotate PDF documents, then you will not need Good Notes. In this session participants will learn about the principals of Universal Design for Learning (UDL) and see how the iPad can support UDL instruction by providing multiple means of representation, expression, and engagement. While the focus will be on the features found in the iPad tablet, equivalent and alternative solutions that make use of the high tech and low tech tools you already have will also be discussed. QR Code to Access Resources! Use a QR app to read the QR code on the right and you will be taken directly to Kit's resources from his session! Applications and tools on the iPad offer educators an unprecedented opportunity to provide flexible content to boost learning in the classroom. In this hands-on session, we’ll explore several iPad apps to create, access and share digital text to support struggling readers. We’ll look at the power behind iBook Author, ePub docs, Read2Go, iBooks and other apps for creating and sharing accessible digital books. Avenues to use one iPad as a classroom teaching and learning tool with students who have ASD. Stop chasing the "app tail" and embrace a few select apps and the power of photo albums and the camera. An expanded version of Proloquo2Go vocabulary designed to support classroom activities will be shared. Photo albums serve as background knowledge vocabulary books and a fun reason to communicate using Storykit. Assistive Technology Can Be Really Cool! This session will showcase a handful of powerful iPad apps that provide students with the added supports they need to successfully participate in the core curriculum. Apps for Science, Social Studies, Math, and English Language Arts will demonstrate the power of the iPad as an assistive technology tool. Please download files below and bring to session. In this session, you'll hear from Apple about ways to deploy iPads in your environment. This includes a discussion of the hardware required to manage dozens of iPads, purchasing apps using school funds with the Volume Purchase Program (VPP), and using the new Apple Configurator tool to prepare and deploy iPads to your students. Organize your classroom ~ Use your iPad for presentation, data and planning. Whether you use your iPad in the classroom to prepare and present your lessons, or to collect and share data, this workshop will explore apps and tools to support all aspects of instruction.